Jeppe Hein’s work, mainly in the form of installations, creates a continuous dialogue between the work, audience and environment, establishing a relationship where the surprise factor plays an important role. Physical experience as a way to reactivate memory and rouse the consciousness is what Jeppe Hein evokes in the project Modified Social Benches. The eleven ‘impossible’ benches located in the woods act as jarring elements in an idyllic landscape which invites the viewer to contemplation, observation, and meditation. 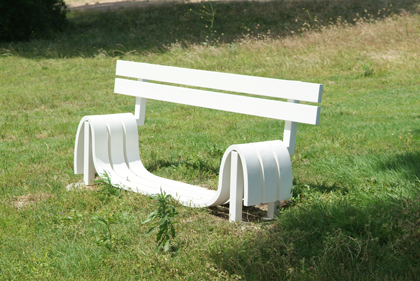 It is impossible to sit down on these ‘social benches’, as the artist calls them, and given this situation, the viewer doesn’t know what to do, creating a sense of feeling out of place, disturbed, upset about not being able to relate to the setting. Under these circumstances, the public space is reactivated in the face of a conflict of misunderstanding, inequality, and displacement generated by the viewer’s own experience, with the viewer being both witness and protagonist of this marginality.